Extraordinary Canyon Road Compound with 3 king size beds and 1 sleeper sofa. Amazing Garden and Patio Areas! Casa de Illume is an extraordinary compound tucked off of the famed Canyon Road! The Main House and detached Guest House is the combination of Casa de Maria and Casita Milagro and the two properties are nestled behind an art gallery off of Canyon Road! The Main House is light and bright with French doors and large windows throughout. 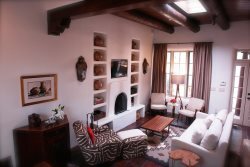 Both bedrooms master suites have en suite bathrooms and are decorated with elegant Santa Fe touches. Master Bedroom 1 features a king-size bed, a flat screen television with cable connection, high speed internet, and master bathroom with a stand up shower. Master Bedroom 2 also offers a king-size bed, flat screen television, bathroom with a tub/shower combination and a washer and dryer. The high-ceilinged living room and dining room (with formal dining table that seats six) offer a great, open space for relaxed entertaining. The updated kitchen is fully equipped with a Viking range and Sub-Zero refrigerator. Stylish furnishings and artwork are found throughout the house. The home's ideal southern exposure and landscaped garden provide the perfect setting for enjoying the wonderful Santa Fe sunlight. The garden and outdoor living space are perfect for enjoying the Santa Fe sky, by day or night. The very special detached casita has been completely remodeled and restored. The interiors were designed by television personality and publisher, Moll Anderson. This charming one bedroom, one bath detached casita offers all the comforts and amenities one could imagine with wonderful outdoor living areas and beautiful gardens through the French doors off the living area and bedroom area. The kitchen is fully equipped and features a Viking Range and Sub-Zero refrigerator. Other amenities include a kiva fireplace, high-speed internet, a large flat screen television and cable channel options, washer and dryer and off street parking! Available as a three bedroom compound during the High Season and Holiday Season, or it can be leased separately (Casas de Maria and Casita Milagro) during the Low Season or Fall months. Ask us about leasing this this property for family reunions, weddings and special events. Event fees will apply. The Main House is approximately 1,500 net square feet. The detached Guest House is 800 net square feet. Outdoor Dining/Patio with Patio Furniture with "Fire Tables" and Candle Lanterns - Fire Gell is not included! Special Note: Guest must order fire gell from Amazon.com or RealFlame.com. Ship to Casas de Santa Fe. Allow 7 days for shipping! Its a great house and the service was excellent. I love your location, much better than the old one... Very friendly and helpful staff..... Makes it all more comfortable and fun..